This is the second in a two part series on David Joris and establishment Anabaptists here is the first: Establishment Anabaptists, part 1: David Joris’ authority and Menno Simons. This is also part of a broader series on the Four Streams of Anabaptism. Today, we tend to think of Mennonites as descended from all early Anabaptists. However, the followers of Menno Simons had some distinctive practices that set them apart from other Anabaptists of their era. Looking at them through the eyes of David Joris and his disciples can help us to understand what set them apart more clearly. Joris’ approach clashed dramatically with the leadership style of Menno Simons. As I discussed in part one of this series, Joris was charismatic; people were drawn to him. Blesdijk pictures the Mennonite elders as hostile and closed-minded, both unwilling and unable to carry on a religious discussion with orderly marshalling of evidence and in the spirit of gentleness (sachtmoedicheyt) that distinguish a true teacher. This multi-part post is the first in the Anabaptist Streams series here on Young Anabaptist Radicals, in which we’ll be looking at different streams of early Anabaptism and making connections with our own context. The series will feature different authors over the coming months and is loosely based on Rodney Sawatsky’s model of four streams of Anabaptism. It will feature different authors over the coming months, each looking at a different stream. In this article (and two following) I’ll focus on the Davidites, a little known Anabaptist sect that had a tremendous impact on Menno Simons and the group that became the Mennonites, what Sawatsky identifies as the establishment stream. The Davidites were the followers of David Joris, an urban prophet responding to massive disruption of the traditional social fabric, what Ferdinand Tönnies called Gemeinschaft (Graham and Haidt, 376). Understanding Joris can help us understand Mennonites and how they became who they are today. I’ll be drawing heavily on Gary Waite’s David Joris and Dutch Anabaptism, 1524-1543. We’ll start by looking at how Joris established his authority as a leader. Anabaptists as a movement rejected traditional sources of authority, so the question of how to organize their own communities was constantly evolving. I was reminded that today, this Memorial Day, marks the anniversary of Thomas Müntzer’s death. He was executed by beheading on this day in 1525. Whatever your thoughts on Müntzer are, he is still part of the Anabaptist tradition, and I will probably be mentioning him in a couple weeks with a post on transformationist Anabaptism. While I do not like Müntzer’s advocacy for violence, there is something that we can certainly learn from him — he took the economic teachings of Jesus and the apostles very seriously. In our day of capitalism, individualism, and greed, his call to return to the economics of Jesus is certainly something we can admire. When my Christian faith first began to radicalize, I became very interested in the Franciscan tradition. 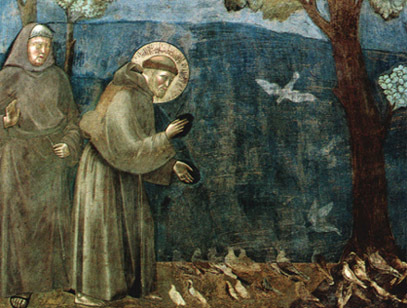 The advocacy for radical discipleship, peace, and social and environmental justice that is associated with the ministry of Francis of Assisi naturally appealed to me. At first, I did as many do, and associated the Franciscan tradition with Roman Catholicism, but as I studied more, I found that the Franciscan movement is actually surprisingly diverse. Back when Francis first started out, there were already a few different sects that identified with his movement, and some were so radical that they were even expelled as heretics. To be honest, I am surprised that Francis was not expelled as a heretic, like so many similar figures were. Even today, there are multiple Franciscan orders in the Roman Catholic Church, and there are numerous Anglican, Lutheran, Old Catholic, and ecumenical Franciscan orders. When I first started investigating the Franciscan tradition, and considered joining it, it was the Order of Ecumenical Franciscans that appealed to me. I actually planned on joining this order. I had spoken with one of their members about it, and even had the application ready to send in, but other events in my life caused me to put that on hold. I started to study other radical traditions, such as the Anabaptists, instead.